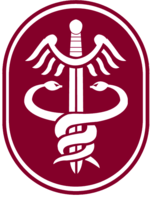 The MEDCOM shoulder sleeve insignia incorporates a modified caduceus with snakes entwining a winged sword, rather than the conventional staff. The new Army Medicine logo. MEDCOM is commanded by the Army Surgeon General, currently Lt. Gen. Nadja West. The Surgeon General is also head of the U.S. Army Medical Department (the AMEDD). U.S. Army Public Health Center (Prov), previously known as the U.S. Army Center for Health Promotion & Preventive Medicine (USACHPPM) prior to 1 October 2009; it and the U.S. Army Veterinary Command (VETCOM) were merged in 2011 to create USAPHC. When Army field hospitals deploy, most clinical professional and support personnel come from MEDCOM's fixed facilities. In addition to support of combat operations, deployments can be for humanitarian assistance, peacekeeping, and other stability and support operations. Under the Professional Officer Filler System (PROFIS), up to 26 percent of MEDCOM physicians and 43 percent of MEDCOM nurses are sent to field units during a full deployment. To substitute PROFIS-deployed staff, Reserve units and Individual Mobilization Augmentees (non-unit reservists) are mobilized to work in medical treatment facilities. The department also provides trained medical specialists to the Army's combat medical units, which are assigned directly to combatant commanders. Many Army Reserve and Army National Guard units deploy in support of the Army Medical Department. The Army depends heavily on its Reserve component for medical support—about 63 percent of the Army's medical forces are in the Reserve component. As the post–Cold War Army shrank, the U.S. Army’s Health Services Command (HSC) decided to change the way it did business and operate more like a corporation. In 1992, HSC launched “Gateway To Care”, a businesslike approach to health-care delivery. This was to be localized managed care, with improved quality, access and cost. In a design based more on catchment-area management than the previous “CHAMPUS Reform Initiative” (CRI), U.S. Army hospital commanders received more responsibility and managerial authority. Eleven “Gateway to Care sites opened in the spring of 1992. By that fall, all HSC facilities had submitted business plans which were favorably received. Starting in 1994, “Gateway To Care” was gradually absorbed into a new regional Defense Department tri-service managed-care plan called TRICARE, which was modeled on CRI. In August 1993, the U.S. Army Chief of Staff approved a plan to reorganize the AMEDD. The merger of several medical elements resulted in a new, expanded medical major command under the Surgeon General. In October 1993, the "U.S. Army Medical Command (Provisional)" began a one-year process of replacing HSC and absorbing other AMEDD elements. Surgeon General Lt. Gen. Alcide M. LaNoue commanded the provisional MEDCOM, while Maj. Gen. Richard D. Cameron continued as HSC commander. In November 1993, DENCOM and VETCOM were formed as provisional commands under the MEDCOM, to provide real command chains for more efficient control of dental and veterinary units—the first time those specialties had been commanded by the same authorities who provided their technical guidance. The next month, seven MEDCEN commanders assumed command and control over care in their regions. The new "Health Service Support Areas" (HSSAs), under the MEDCOM, had more responsibility and authority than the old HSC regions. In March 1994, a merger of Medical Research and Development Command, the Medical Material Agency and the Health Facilities Planning Agency resulted in creation of the Medical Research, Development, Acquisition and Logistics Command (MRDALC), subordinate to the provisional MEDCOM. The MRDALC was soon renamed the U.S. Army Medical Research and Materiel Command (USAMRMC). Then, in June 1994, an additional HSSA was formed to supervise medical care in Europe, replacing the 7th Medical Command, which inactivated. That summer, the Army Environmental Hygiene Agency formed the basis of the provisional Center for Health Promotion and Preventive Medicine (CHPPM). Thus, in an unprecedented process of unification, U.S. Army medicine gradually came together in a new home under the command of the Surgeon General. Except for the field medical units commanded by the combat commanders, virtually all of Army Medicine is now part of the MEDCOM. The MEDCOM became fully operational, dropping the "provisional," in October 1994. In 1996, the HSSAs were renamed Regional Medical Commands. In 2016, to Regional Health Commands. ^ Mayer W., et al (1988), “A first report of the Department of Defense external civilian peer review of medical care”; JAMA, 1988 Nov 11;260(18):2690-3. ^ Buck A.S., et al (1992), “The Department of Defense Civilian External Peer Review Program: an interim report”; Mil Med, 1992 Jan;157(1):40-6.